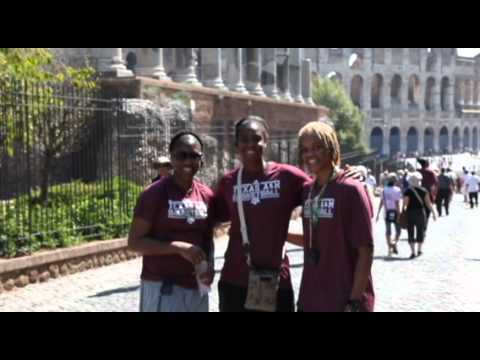 The bus rolled out of Aggieland at 7:30 a.m. Thursday morning and the Aggies arrived in Rome, Italy, at 8:30 a.m. Friday morning, or 1:30 a.m. for those of you back on central time. After a three-hour flight from Houston to Newark and an eight-hour flight from Newark to Rome, everyone was ready to stretch their legs and we did just that upon arrival. The great folks with Basketball Travelers met us at the airport and first gave us a riding tour of Rome in the first-class, air-conditioned charter bus, before allowing us to get our exercise for the day. First we toured the Colosseum, and because we had such great guides, we skipped the long for tickets and walked right in. What a grand place with so much interesting history. From the Colosseum, everyone was famished and ready for lunch, which we grabbed around the Trevi Fountain. It is said that if visitors throw a coin with their right hand over their left shoulder, it will not only bring them luck, but will ensure a return to Rome. As you can imagine, the team and the entire travel party was pretty exhausted on this first day, trying to adjust to the seven-hour time difference. After a quick stop at the Spanish Steps on the way to our hotel, the afternoon was spent relaxing and catching a much-needed nap before dinner. If you’d like to see a photo gallery from today, visit facebook.com/AggieWomensHoops. Make sure to follow us on Twitter @Aggie_W_Hoops for updates throughout the day. We’re off to the Vatican City bright and early tomorrow morning and look forward to sharing it with you!